Applied Fiber is a synthetic cable solutions provider; with expertise in terminal design, cable design, testing, and production. As a manufacturer, Applied Fiber specializes in the production of tightly controlled, high volume synthetic cable assembles. Our pursuit of a consistent mass-produced synthetic cable has led to the development of the Industry's most refined termination product and process. Applied Fiber sets an entirely new standard for the production of synthetic cable assemblies, with focus on providing our customers with a reliable, cost effective synthetic alternative. With over 20,000 terminations tested and over 25 patents filed, Applied Fiber is the world leader in synthetic cable termination and assembly technology. Our advancements in the field of mechanical terminations are unmatched in areas of: size, weight, strength, versatility, fatigue resistance, length stability, and repeatability. 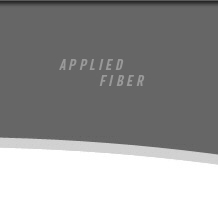 As a provider of application-specific solutions, Applied Fiber consistently develops new technologies to resolve challenging system requirements - many of which have patents pending.